Firefighters were called to a blaze at a bungalow in Telford. Crews were called to the property in Lambeth Drive, Brookside, just after 8pm on Saturday. Shropshire Fire and Rescue Service said they extinguished a fire which had been caused accidentally through cooking. It is not known how much damage was caused by the blaze but the fire and rescue service said nobody had to be rescued. 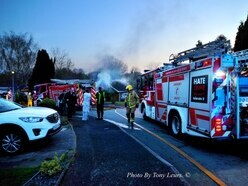 Tony Leurs, of Stirchley, was passing the scene when he spotted the fire and took this picture. He said: "There were three fire engines there and a lot of the neighbours had come out of their homes to see what was happening. "There was a lot of smoke coming from the property but I couldn't see any flames."